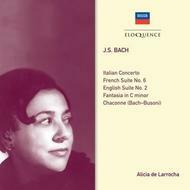 This collection includes all of Alicia de Larrocha’s analogue Bach solo recordings for Decca. Two Suites and the Italian Concerto form the backbone of this release, but there are also three Bach transcriptions – two by Harriet Cohen, and the mighty Chaconne by Busoni (the 1973 recording - Larrocha recorded it a second time in 1986). These are jaunty and genial performances, beautifully shaped and with ease and nimbleness of fingerwork. But when epic grandeur and Romantic sonorities are called for, such as in the Bach–Busoni Chaconne, Larrocha unleashes playing of epic proportions. This release forms part of an on-going series of Alicia de Larrocha’s Decca recordings, with those of the English Suite No.2 and the C minor Fantasia appearing on CD for the first time.